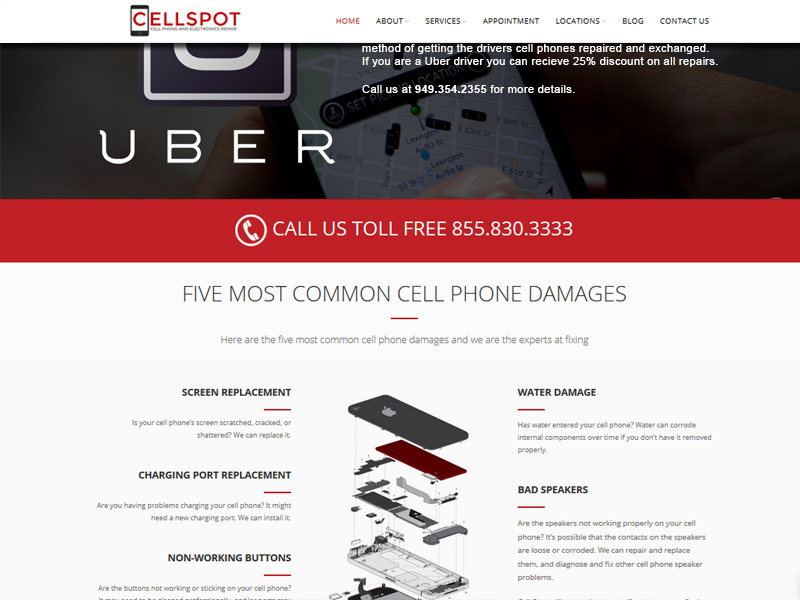 Cell Spot has been specializing in cell phone repair services for a large selection of phones in the Orange County area. With their expansion by adding two additional locations, they decided it is a good time to both have a complete site redesign, as well as a new Search Engine Optimization strategy to get their new locations as well as their existing ones on the top spots of Google Search. Rizer first designed their logo and Corporate Identity package including flyers and brochures. Then they developed a modern site with easy navigation and user interface for CellSpot, which included information on every model of phone they service. Additional services they offer such as their mail repair, and mobile drop off service were also highlighted. Once their site was complete, efforts were focused on both on-page and off-page processes as part of the SEO strategy. After only a few months, their site began to rank organically at the top of Google for all their requested keywords and locations including “Tustin Cell Phone Repair”, “Irvine Cell Phone Repair”, “Santa Ana Cell Phone Repair”, and “OC Cell Phone Repair” among others.